Pull Me Under is a novel about a woman who's on the search to rediscover herself by finally combing her current life with her past life. This was, yet again, a pick from Book of the Month. At 12 years old, Chizuru - an Japanese-American girl living in Japan - stabbed and killed her classmate and bully with a letter opener. She had been closed to her mother, who had recently died, and her father, a living national treasure, didn't seem to care much for her. After an eight year stint in a juvenile detention center, Chizuru moves to America to start anew, as Rio. She meets a man, gets married, and settles down - but her past remains in her past, as she nevers shares her prior life with her family. Years later, she receives a mysterious package about her father's death and travels to Japan, alone, to rediscover herself. This novel sounds so interesting, but it left me feeling unsatisfied. There was so much more potential with the book and I was never overly-impressed. As usual, I wasn't a fan of the majority of the characters in the book, who were mostly selfish. I felt the end of the novel was rushed and wrapped up quickly, while the rest of the novel could (and should) have gone in a different path. I wouldn't recommend this book. 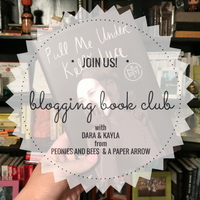 Now feel free to follow along below to find out what Dara (of Peonies & Bees) and I really thought of the novel. Then feel free to link up any book-related posts below. Beware, there are spoilers past this point. 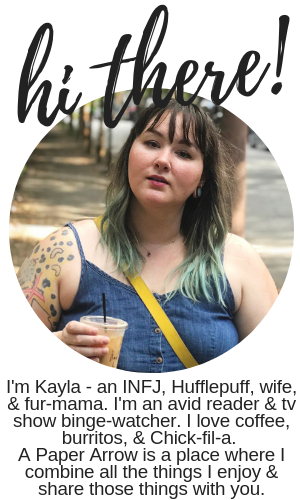 Kayla — I honestly felt neutral with it. Nothing really stood out to me throughout. I'm such a big fan of thrillers, that sometimes anything else seems to fall short for me. I didn't hate it, but I didn't love it. Dara — I thought it had a lot more potential, but was still a pleasant read. I really liked the writing, and the beginning of the plot, but it sort of fell short for me. With that said, I had a hard time putting it down. I loved the little details, and the main character, but I think it could have been taken in a very different direction. Did you decide right away if you liked or disliked the book? K — The beginning really intrigued me, but I felt it going another way would have been more exciting. I read the book fairly quickly, because it was interesting, but I don't know - it just didn't really do anything for me. D — I'm sort of obsessed with Japan and Japanese culture, so I really liked reading the food descriptions, and the old tales, temples, etc. So I knew right away I’d enjoy it. Plus, it started off with an 12 yr old stabbing a boy with a letter opener, strong opening! Did you feel strongly about any of the characters? D — I really didn't like Danny and felt like her whole narrative was forced to fit in. It made almost no sense how weird and secretive she was, yet included Rio on her journey. And I kind of hated that Rio went to visit the parents of the boy she murdered. How awful. K — Yes. Danny was the worst. I figured out from the moment Rio/Chizuru went to the funeral that Danny had been involved with Rio's father somehow. I don't understand why she said the letter said what it did - that took it past her being secretive - that was being mean and hateful. Rio needed some kind of closure from her father (even though she hated closure), but Danny was the worst. I think Rio could have decided to do that hike on her own and met what's his face - he was super sweet and I liked him. Did anything surprise you, or was the plot predictable? D — I wouldn’t say it was predictable, but I wasn’t blown away, or surprised with any twists either. K — I think the only thing that surprised me in the entire book was that she got arrested - that was random. K — I felt like the writing at the ending felt rushed. What did you rate it on Goodreads? D — I gave it 4 stars, but only because I I really love Japan... probably the worst way to judge a book -- based on location -- but that's what hooked me in, and kept me going. K —I judge books in weird ways, too, so no worries! Speaking of Japan, I think it's pretty odd that the author wasn't Japanese or wasn't raised in Japan. She came from California - so that was honestly a little off-putting for me. Have you read this novel? What were your thoughts? Next month, we'll be chatting about The Marriage Pact by Michelle Richmond. These chats and linkups take place the last Tuesday of each month, so make sure to stop back by on May 30 to talk about The Marriage Pact. For now, link up below! I can imagine liking a book more just because you have fond feelings for the location or time period that it's set in! I also got this book from BOTM but haven't read it yet! I made sure to avoid spoilers lol. I'm looking forward to it just because it looks different from anything that I've read lately but it's good to know that it also has some flaws. I'm looking forward to seeing what you think of the book. I wasn't a huge fan. Well bummer that this book didn't turn out that great. It still sounds interesting to me though. You may very well like it! It just wasn't up my alley! What an interesting plot, though! Yes. The plot was definitely interesting. I actually enjoyed this book. I felt like the ending was kind of weak sauce, but I enjoyed getting there. I definitely agree about the ending! That's maybe what really determined me disliking the book.